What kind of information does Better Than Ever Coaching collect? Better Than Ever Coaching may collect personal information from you when you save or otherwise provide your personal information, such as when you subscribe to the newsletter, purchase a product, register for an event or enter a giveaway. Additionally, Better Than Ever Coaching may collect personal information when you interact by phone, e-mail, or through the website, mobile optimized website, or if you complete an entry form to participate in a contest, promotion or survey. As a result of these actions, you might supply Better Than Ever Coaching with personal information, such as your name, e-mail and postal address(es), phone number(s), credit card information, names of people to whom purchases have been shipped, including address and telephone numbers, product interest information and financial information and in certain circumstances, your opinions and individual preferences. When you visit the website, Better Than Ever Coaching may also gather certain information automatically and store it in log files. This information may include without limitation browser information, Internet Service Provider (ISP), operating system, Internet Protocol (IP) addresses or other device identifiers, location and date/time stamp. Why does Better Than Ever Coaching collect my information? Your personal information may be used to process your transaction and provide you with the product or service you requested. Additionally, this information may be used to send you periodic emails containing information and updates pertaining to your order. Better Than Ever Coaching may also use this information to provide you with company news, updates, related product or service information, etc., as well as, conduct marketing and performance research, to assist in measuring customer service, benchmarking performance and to help improve the shopping experiences and product offerings. As provided below, you may always choose not to receive promotional materials or marketing information. Does Better Than Ever Coaching share my information with third parties? If you visit or purchase services or products on www.BetterThanEverCoaching.com, participate in a contest, survey, promotion or special offer, Better Than Ever Coaching may share your personal information with that Better Than Ever Coaching affiliate, so they can communicate with you (whether by e-mail, post or otherwise) and provide you with promotional materials and additional information about its products, services, contests, promotions and special offers that may be of interest to you, or collect and use that information subject to and for other purposes contemplated by this policy. Better Than Ever Coaching may use a third-party service provider to conduct contests, surveys, promotions or special offers; that company will be prohibited from using Better Than Ever Coaching users’ personal information for any other purpose. 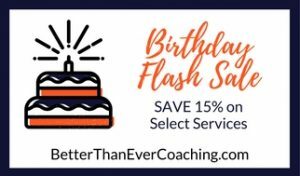 Better Than Ever Coaching will not share the personal information you provide through contests, surveys, promotions or special offers with other third parties unless Better Than Ever Coaching gives you prior notice and choice. Better Than Ever Coaching does not sell or rent your personal information to non-affiliated third parties except as permitted by law or as outlined within this policy. Better Than Ever Coaching may also use third-party advertising agencies to collect data and/or serve ads when you visit the website. These agencies may use information (not including your name, address, email address or telephone number) about your visits to this website in order to provide tailored advertisements about goods and services of interest to you. If you would like more information about this practice or opt-out of receiving these ads, visit http://optout.networkadvertising.org/. Better Than Ever Coaching may transfer personal information to non-affiliated third parties, such as a shipping company to fulfill orders, a credit card processing company to bill you for goods and services and an email service provider to send out emails on Better Than Ever Coaching’s behalf, pursuant to agreements that prohibit the third parties from using or disclosing the personal information other than for the purpose of processing and which impose security safeguards appropriate to the sensitivity of the information. The collection, use, and disclosure of information contemplated in this policy may involve a transfer of the information to jurisdictions located outside your country of residence that may not have equivalent laws and rules regarding personally identifiable information. By way of example, this may happen if one of Better Than Ever Coaching’s service providers is located in a country outside your home country. In these cases, we will take steps to ensure that your privacy rights continue to be protected. Better Than Ever Coaching reserves the right to disclose your personal information as required by law, and as necessary to protect the property, interests and rights of Better Than Ever Coaching and the Better Than Ever Coaching affiliates. How do I stop receiving emails from Better Than Ever Coaching? If at any time you would like to unsubscribe from receiving future emails, each email sent from Better Than Ever Coaching includes unsubscribe instructions at the bottom. If you have any questions, please click here to fill out a Contact form, call (508) 896-5779 or send mail to P.O. Box 391, Brewster, MA 02631. How can I access or change my personal information, withdraw my consent, or make inquiries or complaints in relation to this policy and Better Than Ever Coaching’s privacy practices? Better Than Ever Coaching will ensure the personal information collected is as accurate, complete, and up-to-date as is necessary for the purposes for which it is to be used. You are entitled to request access to and correction of your personal information collected by Better Than Ever Coaching. In order to make such a request, or if you have any questions or to make a complaint in relation to this policy and Better Than Ever Coaching’s privacy practices, please click here to fill out a Contact form, call (508) 896-5779 or send mail to P.O. Box 391, Brewster, MA 02631. If you have consented to the collection, use and/or disclosure of personal information as identified herein, please note that you can also withdraw your consent at any time by communicating with Better Than Ever Coaching as noted above. Better Than Ever Coaching keeps your personal information only as long as is reasonably necessary for the purposes described in this policy or such longer period as may be required by applicable law. Better Than Ever Coaching has adopted appropriate measures to ensure the confidentiality of personal information and to safeguard personal information against loss or theft, as well as, unauthorized access, disclosure, copying, use or modification, in light of, among other things, the sensitivity of the information and the purposes for which it is to be used. When you enter sensitive information (such as a credit card number) on an order form, the transmission of that information is encrypted using secure socket layer technology (SSL) and sensitive credit card data is not stored on the Better Than Ever systems once the payment transaction has completed. No method of transmission over the Internet, or method of electronic storage, is 100% secure, however. Therefore, Better Than Ever Coaching cannot guarantee its absolute security. If you have any questions about security on the Better Than Ever Coaching website, please click here to fill out a Contact form, call (508) 896-5779 or send mail to P.O. Box 391, Brewster, MA 02631.